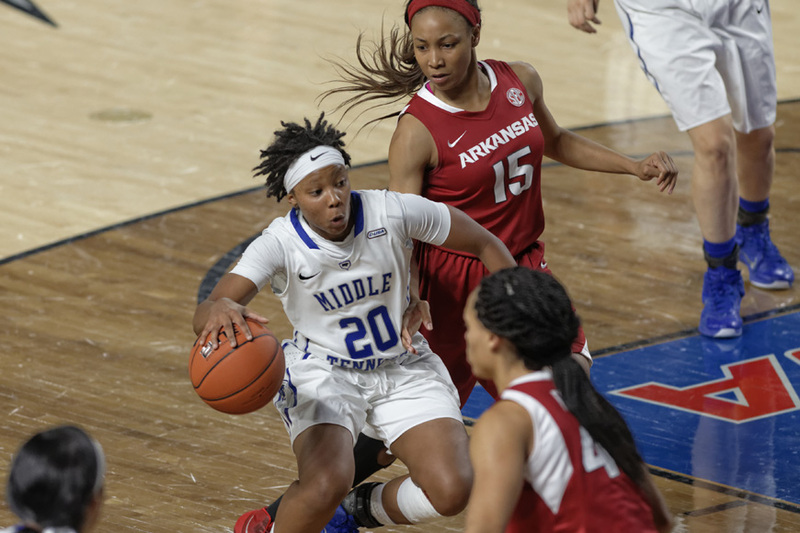 The Blue Raider women’s team came up short on Thursday night, losing a 58-51 contest against the Arkansas Razorbacks. The Razorbacks (3-0) hit the ground running in the first half, going on a 9-0 run. During that run MTSU struggled offensively, going 0-of-6 from the field. 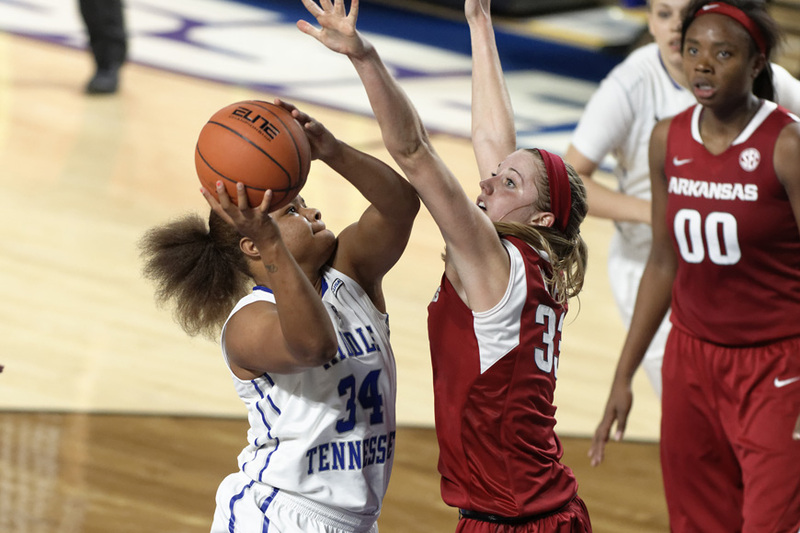 Sophomore guard Olivia Jones scored MTSU’s first two buckets at the 14:56 mark and 14:09 mark, respectively. The Razorbacks controlled the first half with strong inside play and solid defense, procuring a 30-12 lead with four minutes left in the half. The Blue Raiders went on an 8-2 run to cut the lead to 12 (32-20) at halftime. In the first half, the Blue Raiders shot an abysmal 26 percent (7-of-27) from the field, and an even worse 15 percent (2-of-13) from three-point territory. Arkansas’ Jhasmine Bowen proved to have a good first half, scoring 15 points on 6-of-8 shooting. 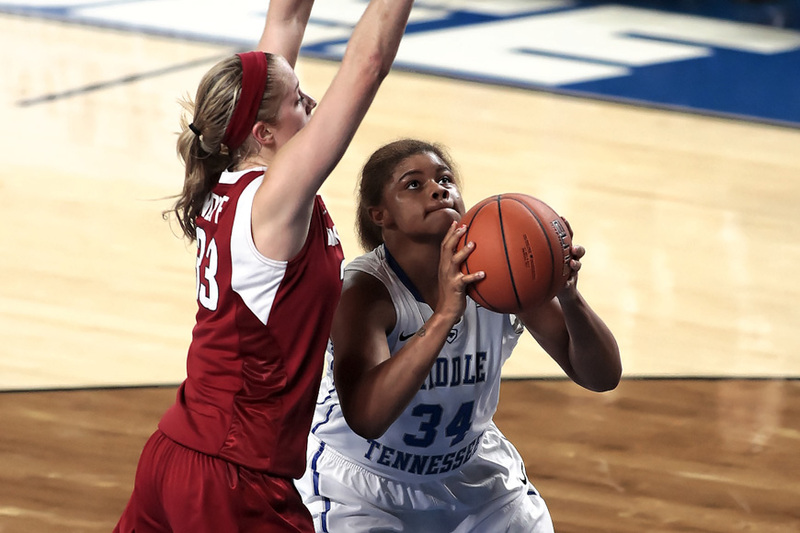 In the second half, Middle Tennessee (1-2) cranked up the intensity. MTSU cut the lead to seven (39-32) with 14 minutes left in the game. 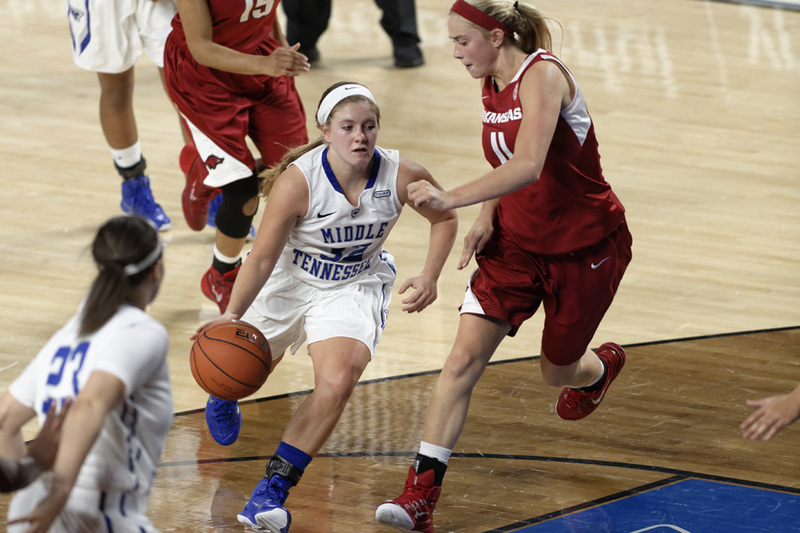 Junior guard Caroline Warden scored five straight MTSU points to cut the lead to four (42-38). 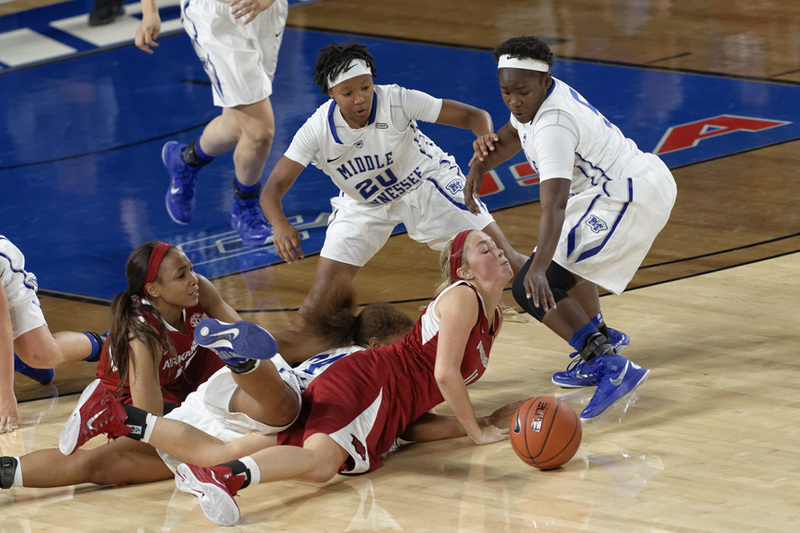 This is closest the Blue Raider women came to tying the game. 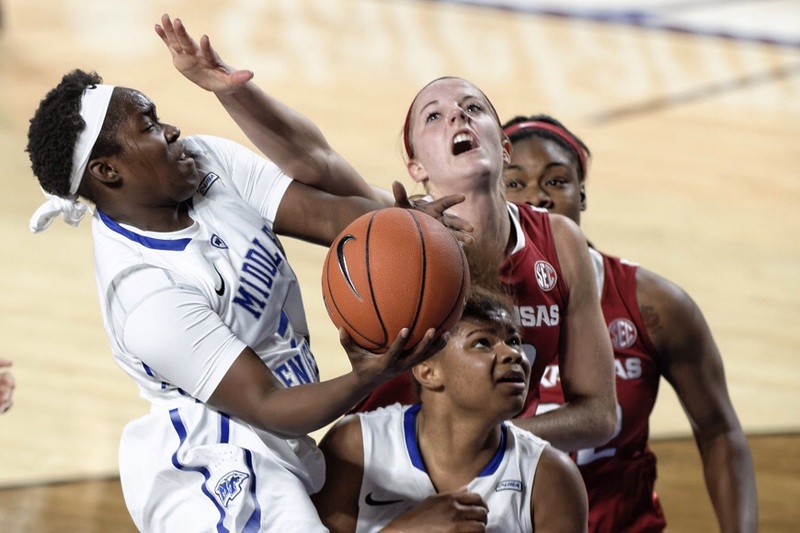 Arkansas regained control and went up 48-41 with seven minutes left in regulation. 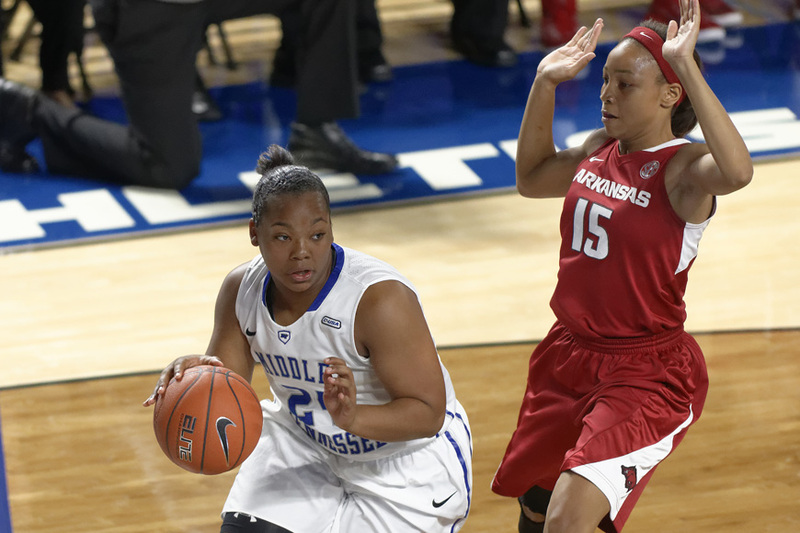 The Razorbacks would not relinquish the lead, despite a valiant comeback effort by the Blue Raiders. Both teams struggled mightily on the offensive end. MTSU shot 28 percent (16-of-57) from the field, 25 percent (7-of-28) from three-point range and 50 percent from the free throw line. Arkansas did not fare much better, shooting 40 percent (19-of-48) from the field, 32 percent (7-of-22) from three-point range and 56 percent (13-of-23) from the free-throw line. 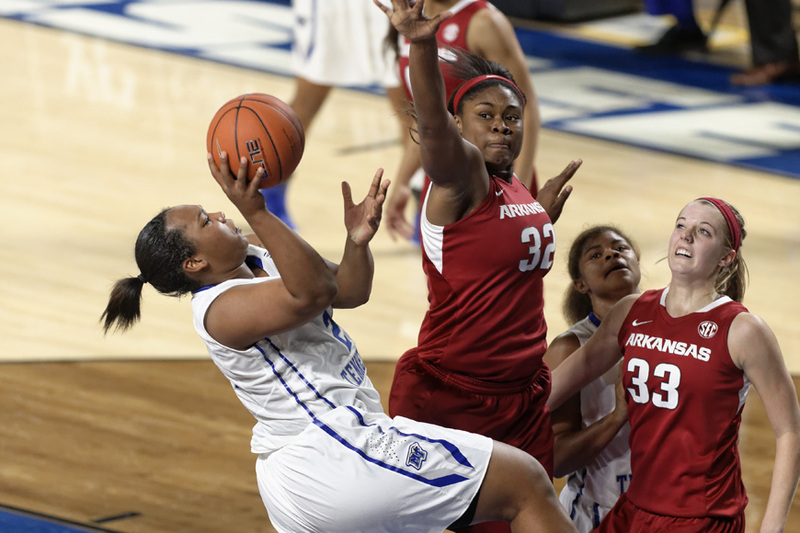 Arkansas’ strength inside was apparent, as the Razorbacks out-rebounded MTSU 44 to 38. Caroline Warden was a spark plug off the bench, scoring a team high 15 points on 5-of-8 shooting. She scored 12 of those 15 in the second half. 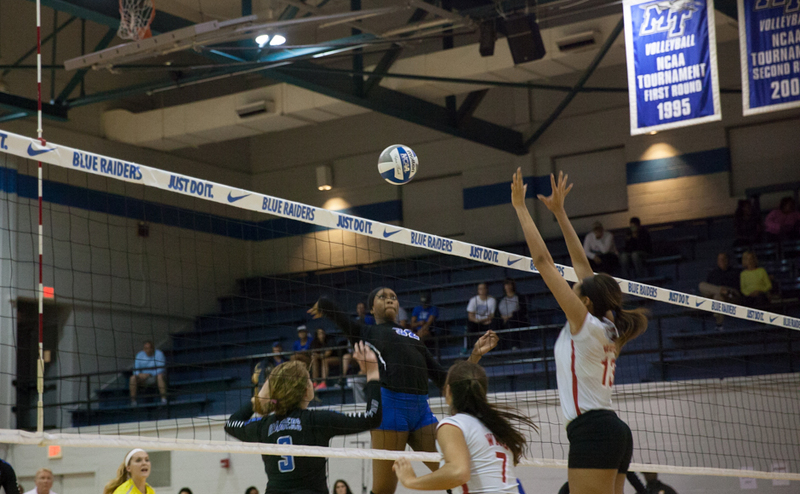 “I just wanted to give a spark to the team,” Warden said. “We really needed it especially in the second half. I was getting open shots and I wanted to the knock them down and help the team.”Jones notched a double-double tonight, scoring 13 points on a dismal 3-of-14 shooting and corralling 13 rebounds. Arkansas’ Bowen finished with a game-high 19 points on 7-of-10 shooting. Jessica Jackson also had a big game with 14 points on 4-of-7 shooting from three-point range. The Blue Raiders will hit the road to do battle with Matt Insell’s Ole Miss Lady Rebels on Nov. 23. Game time for Rick Insell’s squad against his son will tip off at 3 p.m. CT in Oxford, Mississippi.